While the hand itself is basically the same, I've created this pattern in different shapes of the hand. 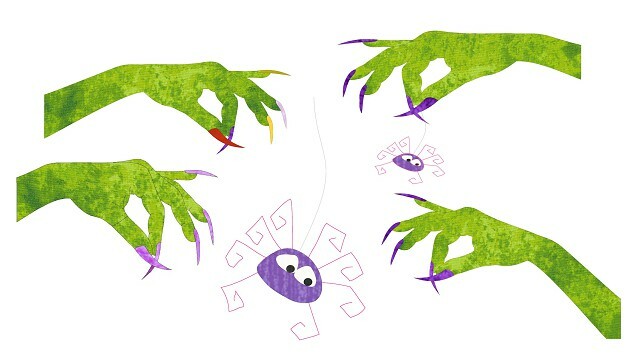 One is my first hand from 2013 which is the bottom left in the image, this year I added the spider, elongated the hand and even put the hand to a corner. The elongated hand comes in 15x10 only. As a bonus, i've given you some extra spiders to play with and they come in 9x6, 12x7, and 15x10 with a special mugrug size of 6x9. When I originally created this pattern back in 2013, I created it in machine embroidery, it's been a favorite of many of my visitors and they asked me to create it as an applique pattern. So, I have finally done so and I hope you enjoy this pattern.